Evolution Ability Enhance [Blood-soaked Flowers]: Summons 2 layers of [Flower Sea]. When HP is less than 75%, Higanbana gets a shield that can absorb damage equal to 20% of lost HP. Upon Evolution, she gets an additional layer of [Flower Sea] when HP < 50%. Higanbana is powerful yet straightforward in terms of Soul build. There are two ways to build her: as DPS or as Control. She’ll be a very effective DPS by using Souls such as Shadow, Seductress, Claw, etc. She’s unique in the way that enemies takes damage when they act. In other words, she does not rely too much on SPD herself. With Shadow, she can take out or critically damage enemies before she gets her turn. Seductress is another popular choice since she can attack a maximum 6 times and this soul is easier to build than Shadow. Control build is actually more popular in high-level Duel. Although it seems counter-intuitive, Shy Soul is a good choice for Higanbana despite the prior bug fix, the reason is that the Soul has high Effect HIT to start with. If executed correctly, the enemies would just sleep through their turn all the time. Even if Ame Onna is there to dispel the Sleep, they would just fall back asleep the next time they act. In that sense, I would say Snow Spirit/Mimic could perform the same way. This is the reason why Higanbana is more preferred as a control. A DPS Higanbana would be built similar to other DPS and use ATK and Crit %. As for sub-stats, Effect RES and HP are preferred as Higanbana will draw a lot of attacks and controls. A control Higanbana would need Effect HIT for sure. HP is important since enemies will try to take out Higanbana as soon as they can. Note that Higanbana needs some ATK to break shields for the control effects to land. Description Initiate the battle with 3 layers of [Flower Sea]. At the beginning of their turns, enemies receive 39% attack damage for every layer of [Flower Sea] (only one Higanbana would take effect). One layer would diminish each turn. For every 25% of max HP lost, Higanbana gains 1 layer of [Flower Sea] to a max of 6 as well as gaining a shield from [Bloody Flower Sea]. Description Summons 2 layers of [Flower Sea]. When HP is less than 75%, Higanbana gets a shield that can absorb damage equal to 20% of lost HP. Upon Evolution, she gets an additional layer of [Flower Sea] when HP < 50%. In a more passive team setup, you could use Ame Onna combined with Usagi to mitigate status effects on Higanbana. 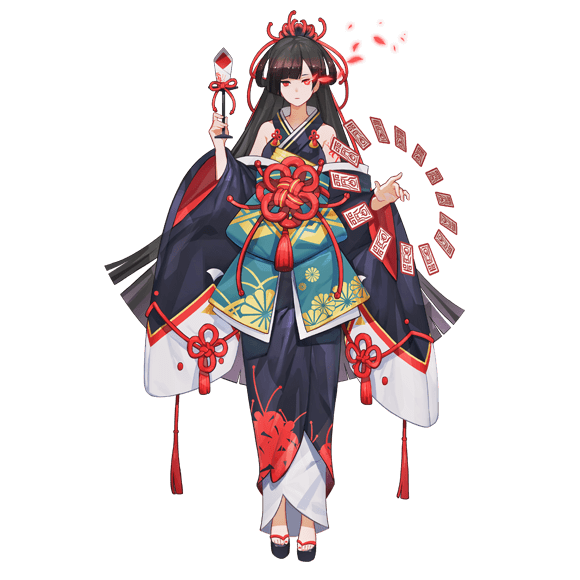 There are two key effects that Higanbana is most afraid of: Seal and Morph since they will seal her passive. With the release of Hannya, Seal will be much more common before. Ame Onna will be able to dispel Seal. Morph is a bit tricky since it is not a common effect. Enma and Yamausagi can Morph Shikigamis. Enma is SSR and underrated so she is still not too common and Yamausagi is not exactly a popular choice for control. The newly released Komatsu is another unit that comes with Morph and she’ll be more problematic as people start to use her to counter Higanbana. Therefore I suggest bringing Usagi if you see any of these units. Shouzu and Momo are for general survivability since players with strong ST DPS will aim to take out Higanbana in one hit. More aggressive teams can try to bring Kamaitachi and other control units to further control the battle. With Higanbana and Samurai X, the other team should not have a chance to move at all and just wait for the fight end. Depending on situations, you can switch units around to add Hannya and Hououka into the mix. They can counter the Inugami teams, which is commonly used against Higanbana. Control Higanbana is very suitable for PvP. In the beginning, Higanbana will appear invincible because players haven’t gotten used to her mechanics. In the long run, she will still have a spot in top tier teams due to her unique passive. A DPS Higanbana will for sure be able to do Soul runs. The only drawback is that she needs to wait for enemies to act so is quite a bit slower than many of the popular DPS right now. Though, a Nightwing Higanbana can solo Sougenbi and carry fodders. Most bosses are slow so DPS Higanbana is not super effective. Secret zone, Totem zone, and even Sougenbi have fast enemies so these are the areas where I see Higanbana performs much better. Shiro Mujou – This is actually a less known Shikigami than his partner but if we want to talk about DOT (damage-over-time) units, then Shiro Mujou is one of the few in Onmyoji. He and Higanbana are very similar in damage output. They both deal damage at the beginning of the enemy’s turn. Therefore, their Soul and team set up are somewhat transferable. They are not without difference too. Higanbana, being SSR, is quite a bit strong. She attacks more and because her attack comes from her passive, she can neglect many of the status effects. Shiro Mujou does have the advantage of that his attack comes with a status effect so he doesn’t have to rely on Soul effects in that regard. Overall, though, Shiro Mujou is definitely underwhelming in the face of Higanbana. Yuki Onna – Though not as popular as Samurai X, Yuki Onna is another very strong control unit. As opposed to Higbabana, Yuki Onna has innate control effects so she doesn’t need to depend on Souls. This also means she can by-pass shields (shield can only block Soul effects). Now there are some inconsistencies in this (e.g. Shy Soul can actually bypass shield the last time I checked), but I would think the bug should be fixed soon. Both Higanbana and Yuki Onna have shielded themselves but Yuki Onna’s is easier to trigger. One of the biggest advantages of Higanbana is that her control effect can negate Ame Onna’s dispel due to her mechanics. Higanbana will be hell to many players upon her release. The reason is that people need time to get used to her mechanics and develop countermeasures. That was what happened in CN server. For Global, she’ll still be difficult to deal with in the beginning but NetEase is much more balanced this time. For one, Higanbana got nerfed compared to when she was released in CN. More importantly, she is released with three of her counters in Global on May 9th. There are really three types of counters to Higanbana: protect against her attacks, nullify her passive, and take her out asap. Ichimokuren/Shiro/Koi/Clam can offer effective protection against Higanbana’s first wave damage. This way the players can at least fit one round of action in and try to control or take her out. Hannya/Enma/Komatsu are pretty much the only ones that can reliably control her by disabling her passive. Though, they need to be sturdy enough to withstand some hits to have a chance to get their controls in. Ibaraki Doji/Hakuro are some of the best ST DPS out there that can take out Higanbana in one hit. Of course, the Soul requirement is very high. In this regard, the use of strong ST DPS in conjunction with Inugami/Vampira/Hitotsume/Mirror Lady is more realistic. Higanbana’s attack will very easily trigger these guys to counter. Think of her as a top-tier AOE DPS with low orb consumption so she’s very capable in carrying fodders. As mentioned before, she attacks too slowly to be effective. An exception would be Sougenbi which she can solo with Nightwing. One of the best unit in PvP right now. She dominates low-mid range PvP. To stand a chance against her, your teams needs to be at least in G5 with good souls. To beat her, you need to have a good team dynamic and plan. She’s useful against enemies that are fast. The more they act, the more damage they take. Bosses are usually not very fast so there are better DPS than Higanbana in this regard. Totem, Secret, and even Sougenbi are somewhat fast so she can be used here. She’s an effective AOE DPS but just too slow for me to do Soul 10 runs. She can solo Sougenbi with Nightwing and therefore can carry fodders. I will aim to get Higanbana for sure. There are quite a bit of way to counter her right now but she would always be relevant due to her mechanics. I would argue she would be much more useful as a control unit than DPS. It’s a shame that all of her counters get released at the same time lol. It’s definitely a good thing so she won’t throw the game off balance. The key to keep in mind is that she is not invincible, same as all Shikigamis, not matter how good your setup is so if you are faced with too many of her counters, consider using something else.